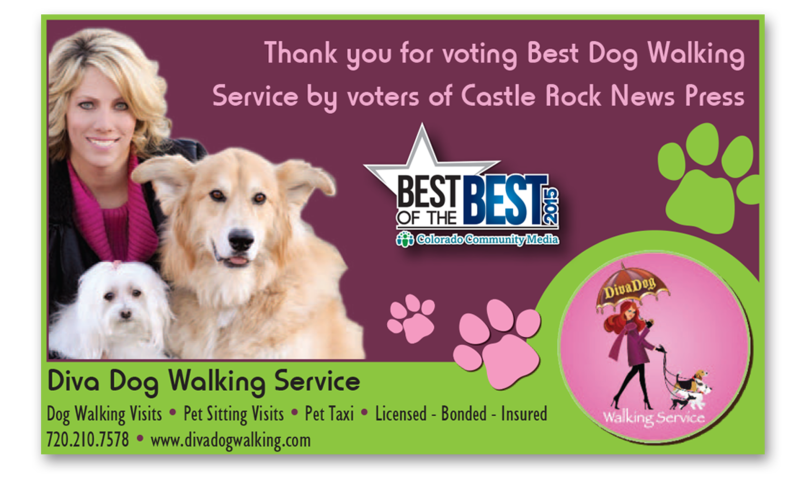 We service Castle Rock Colorado and surrounding area with quality canine fitness and training. We are dedicated to providing the best overall experience for your dogs, combined with the highest quality of service in the industry. We feel that a gentle approach using positive, reinforcing rewards is the only humane method of training and we are committed to this approach. 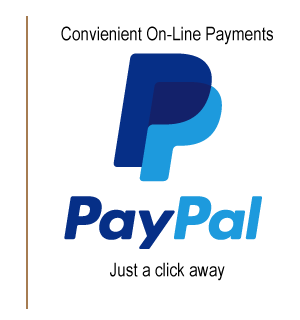 Please check out our services page for more information about our services and pricing. Everyone has their reasons for using a dog walking service. Here are a few things to consider. Dog walking helps dogs become better socialized and minimize improper behavior. Dog walking gives dogs the opportunity to burn energy so that they are quieter, calmer and better behaved when you get home. We teach the dog basic leash and behavior skills. We work on our clients dogs to be polite Diva Dogs. 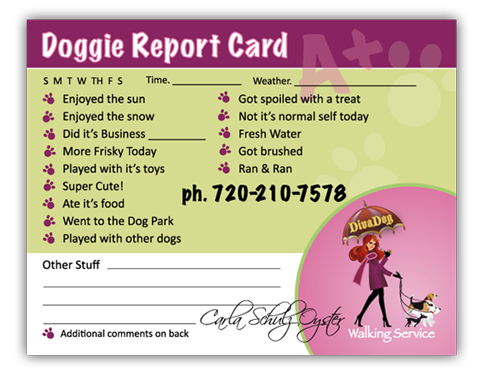 We offer a Doggie Report Card for every visit. Our pets are a special part of our life, and as such we hate to leave them or have them treated any different than if you were there. But life goes on and you have to do what you have to do. That means business trips, family trips and going to your daily grind. Allow your pet to stay in their own home...where they love to be. Give them some playtime, so they don't act so crazy when you get home. Give you peace of mind knowing that "We take loving care, when you're not there." Contact us today to arrange pet sitting service for your best friend(s).